NostradamusPROmt4 is a stable Expert Advisor for automated trading. 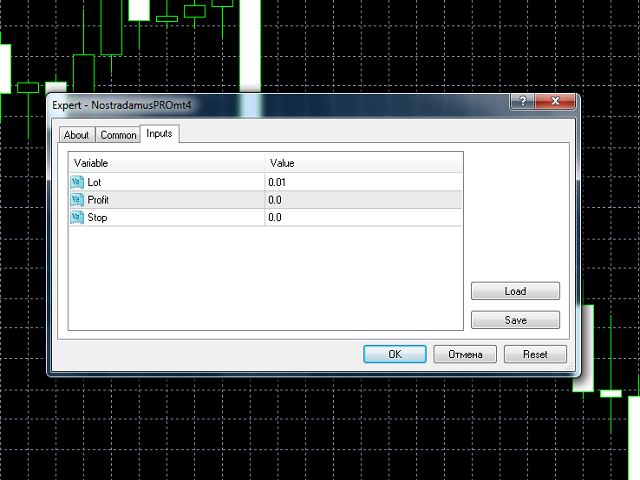 The trading algorithm of this EA is based on the NostradamusMT4 indicator. The indicator is based on an original price calculation method (ESTIMATED PRICE) for the current candle price. The EA is installed in the usual way and is suitable for trading any trading symbols. The EA is designed for trading on the D1 timeframe. Optimization of the EA parameters is not required. Lot - volume of the trade operation (0.1 Lot per 1000 currency units of the deposit is recommended). Profit - profit in the deposit currency to close the position. If Profit = 0, the profit value will be calculated automatically depending on the market situation. Stop - loss in the deposit currency to close the position. If Stop = 0, the loss value is ignored. Note: this expert can be used on any timeframes - M1 ... MN, but the maximum stability is achieved on the daily charts, both in the short and long term.